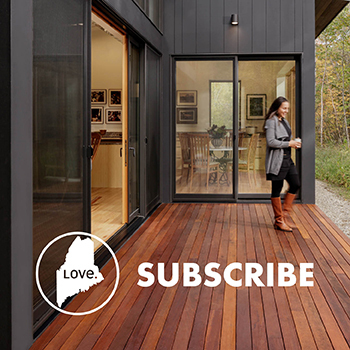 The Ridgeline House is an environmentally sensitive and responsive modern home being designed and built by ECHOSTUDIO on top of a ledge 90 feet above and 450 feet from Casco Bay. Conceived as a series of lines that become a collection of spaces, the design of the house seeks to better connect the lives of the inhabitants with the surrounding natural elements. In some ways this connection was achieved through subtraction. The selective cutting of trees along the ridge created a clearing between an open and sun-filled oak grove to the south and a dark and dense evergreen forest to the north. The home now fills the clearing between the two forests. Nearly floor-to-ceiling windows and doors on the first level allow the exterior spaces to flow into and through the interior. Upstairs, large rectangular windows frame views of the forest and bay. The design of the house also juxtaposes and combines natural and manmade elements. For example, unfinished eastern white cedar shiplap has been set vertically in a series of rows around the exterior of the house. Machine-milled and orthogonally arranged, this siding has been left to silver naturally to continually display the wood’s irregular knots and organic grain over time. In a town rich with historic homes, the Ridgeline House is being built to the Passive House standard. 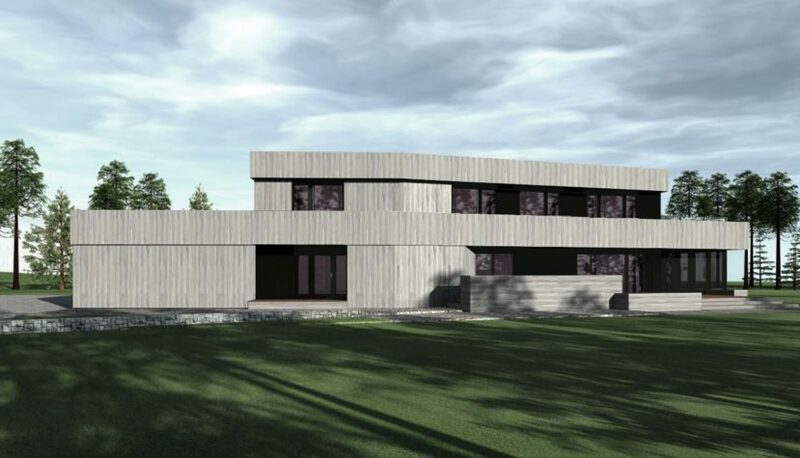 With more than twice the insulation and nearly ten times the air tightness of typical new construction, the Ridgeline House will consume a fraction of the energy usually used for heating and cooling. Future roof-mounted solar arrays will make the home net-zero. A Gortex-like weather-resistant layer in the exterior walls will keep the elements out while letting any condensation within the walls escape, for a healthier, mold-free home. An energy-recovery ventilator will provide fresh oxygenated air and exhaust stale air while preserving 90 percent of the energy used to heat or cool the interior spaces. Triple-pane windows are set beneath deep overhangs along the south side to shield the interior from solar heat gain in the summer but allow the sun’s warmth to radiate inside in the winter.